Blueberry Scones - soft, crumbly and sweet homemade scones loaded with fresh blueberries. Perfect as afternoon tea with a cup of tea or coffee. One of the things I love most is afternoon tea, with my favorite cuppa tea or coffee, warm and crumbly scones with jam, and a few good friends, sitting out on the deck or patio, having fun conversations. Spring is just perfect for this…hence this amazing blueberry scones recipe to share with you. 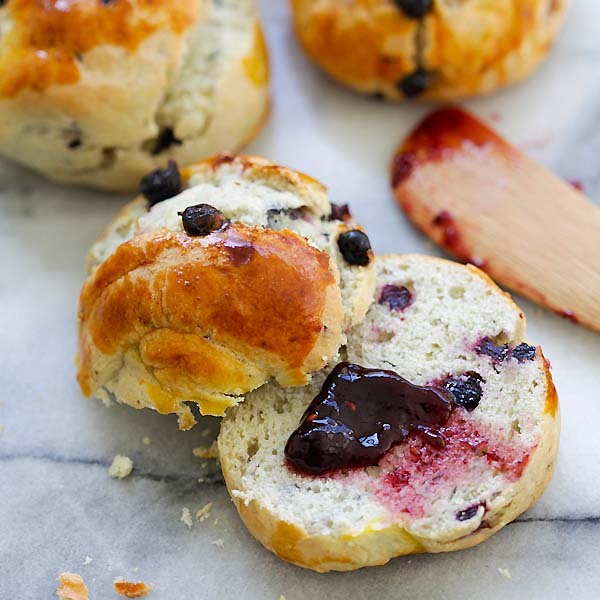 I have tried this scones recipe many times, with raisins, but I decided to swap them out and replace with plump, juicy blueberries. The end result is even better, as the fresh blueberries are just perfect for these sweet and crumbly scones. They lend a tiny bit of tartness to the scones, and when pairing with a fruity jam and a cuppa tea of coffee, you have the perfect afternoon tea scones! I would bake a big batch of these blueberry scones and have them for breakfast, too. Little G loves scones for his afternoon snack. Pre-heat the oven to 400 F. Combine the flour, sugar, baking powder, and salt. Add in the butter until mixture resembles coarse crumbs and then follow by the egg and vanilla. Add in the milk slowly. If the dough becomes too sticky, stop adding the milk, instead add a little more flour to form the dough. Stir until the dry ingredients are moistened. Add in the blue berries. Roll out the dough on floured surface to 3/4-inch thickness. Using a 2-inch round cookie cutter, cut out the scones. Using your hands to smooth out the surface of the scones to make them slightly rounder on the edges. Gather the scraps; re-roll and cut out additional scones. Place the scones on prepared baking sheets, spacing apart. Brush egg yolk over the tops of the scones. Bake scones until golden brown, about 15-20 minutes. Serve warm. If the dough is too sticky, add more flour to the dough. All photos and recipes on Rasa Malaysia are copyright protected. Please do not use the photos and recipes without prior written permission. If you wish to republish this recipe, please rewrite the recipe in your own words instead of copy and paste and link back to //rasamalaysia.com/blueberry-scones/. Thank you very much! I would like to try this but can I use FROZEN blue berries? Thank you. Yes, blueberries are nice, you will love these blueberry scones. Can you refrigerate or freeze the dough and bake later ? I think so, but just thaw. 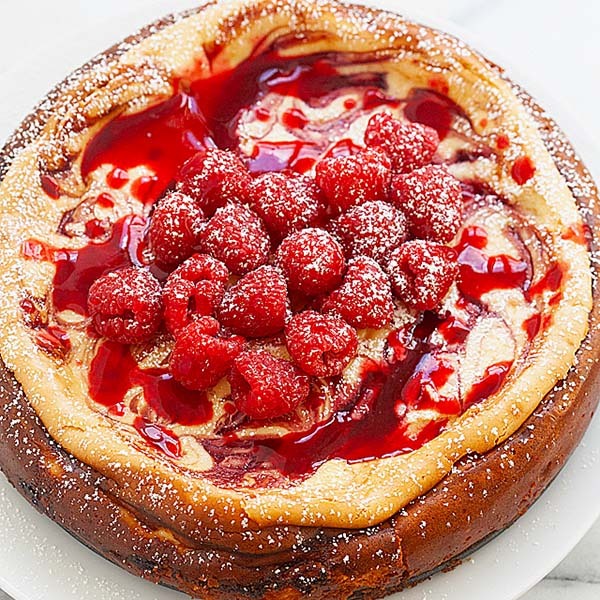 I’ve tried this and it turns out beautiful but some of the scones were actually bitter. Any idea why? Could it be the baking powder? Is the portion right? Do we need to sift the dry ingredients? I am not sure why, did you mix the ingredients evenly? Yes you might sift the dry ingredients. I’ve been a fan since I found your cookbook Easy Chinese Recipes at the Library and managed to my own copy. You’ve done it again, because this recipe makes itself as I read it and processed it in my mind. Now I’ve got to make these scones, just like you forced me to make my own Chinese food. Great job. Thank you oh so much. I am not sure if you should change the comment. Again, thank you for all the great recipes. My wife and I owe you.